Recently, a British mother was convicted for letting her 10 year old daughter walk to school on her own. The current interpretation of the law accused her of being reckless. At the same time, many educators and psychologist fear that by being overprotective we deprive our children of essential pillars necessary for growing into autonomous and self-confident human beings. Doing the right thing requires our active attention. “OK” choices can be made by understanding the law and the rules, and by applying these rigidly. But optimal decisions – the ones most of us seek – happen when we place a given challenge into its proper context, when we draw from the richness of our experience and when we’re confident enough to trust our sound judgement. Reverting back from parenting to the world of shipping biological substances, doing the right thing is of utmost importance. If we’re reckless we endanger the environment and our fellow human beings. As an organisation, we lay ourselves open costly incidents and legal penalties. In the worst case, we could even bring a company to its knees. If we’re overprotective, we over engage already tight resources such as time and money, hence depriving our company of precious resources that may be better allocated elsewhere. When talking with clients, we’ve found that appropriate Classification is one of the most challenging aspects of shipping biomedical materials. The rules and regulations pertaining to the transportation of biological substances and infectious materials are increasingly complex. Together with heightened enforcement and penalties, companies in the life sciences industry are seeing this evolution as an issue of concern. It’s not surprising then that the knee-jerk reaction of many internal or external shippers is to take the safe road. And, at first glance, who can blame them? The temptation lurks, indeed, to indiscriminately apply the most protective labelling to a shipment, rather than making smart transport decisions based on attentive case by case evaluation. When companies favour default shipping over case by case evaluation, they lay themselves open to an exploding transport budget as well as inefficient transport solutions. 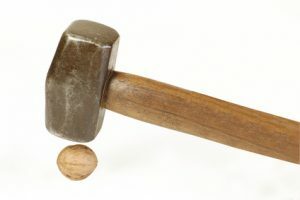 How not to use a sledge hammer to crack a nut. Understanding regulation and applying it judiciously is key to making smart and efficient shipping decisions. which is made up of 3 Lessons, and spans over 3 separate articles. In this Lesson 1/1 we give you a recap of essential labelling and packaging regulations. Lesson 2/3 – It’s all about smart classification – takes you through a set of concrete action steps. These’ll help you make sound classification decisions. In Lesson 3/3 – A Case Study (yet to be published) – we use a client example to demonstrate the approach we used to achieve optimal classification. If you want to receive more articles & tutorials straight to your Inbox, please complete the form in the sidebar (top right). Lesson 1 – Essential labelling & packaging regulations. The most widely applied regulatory scheme for the transportation of dangerous goods is based on a document put together by the United Nations Economic Commission for Europe (UNECE). It is entitled UN Recommendations on the Transport of Dangerous Goods. This document forms the basis for most regional, national and international regulatory schemes. It goes without saying that each country in turn has its own set of rules and regulations that complement the founding UN document. What’s more, in accordance with the Ordinance on Safety advisors, NV Logistics has appointed an external Security Advisor who sets up and monitors regulatory compliance of transportation, documentation and packaging of dangerous goods. Fortunately, most national laws are purposely harmonized with the UN international regulations. This means that in general, the requirements for classifying biologicals are standard worldwide. The UN document mentioned previously divides dangerous goods into nine classes. The World Health Organization (WHO) divides this class into two categories: Category A: Infectious and Category B: Samples (virus cultures, pathology specimens, used intravenous needles). Click on the image to download a printable version, for your reference. European regulations concerning the international transport of dangerous goods by road. Category A shipments are rare, as there are only a few laboratories in the world authorised to receive such substances. 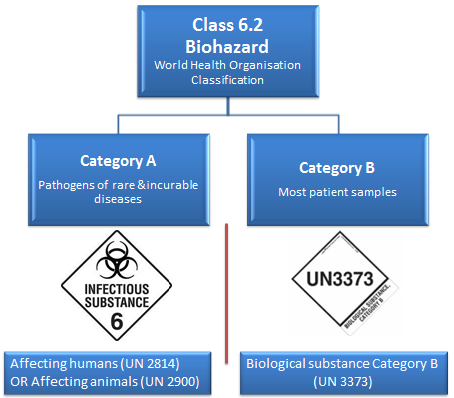 UN 2814- Infectious substances affecting humans and animals: An infectious substance in a form capable of causing permanent disability or life-threatening or fatal disease in otherwise healthy humans or animals when exposure to it occurs. UN 2900- Infectious substances affecting animals only: An infectious substance that is not in a form generally capable of causing permanent disability of life-threatening or fatal disease in otherwise healthy humans and animals when exposure to themselves occurs. UN 3373- Biological substance transported for diagnostic or investigative purposes, which includes most patient samples. In other words, pathogens not listed in the Category A table. Common examples of Category B samples are HIV, HPV, Hep C, and so forth. Classifying a shipment starts by A or B Classification – and we may well leave it at that. Many organisations do! The objective of this series of articles and the pertaining tutorial lessons is to invite motivated professionals such as yourself to “do the right thing”. With more insights at your disposal, you’ll be in a position to nourish a more nuanced view. Please sign up for our next article and Lesson 2, where you discover easy to use action steps that guide you through the Classification process. We give you 3 Lessons, spanning over 3 separate articles. In Lesson 1, Article 1/3, we set the scene by providing a recap of essential labelling and packaging regulations. In Lesson 2, Article 2/3, you discover easy to use action steps that guide you through smart Classification. Lesson 3, Article 3/3 – “Smart Classification. A case study” (yet to be published), presents a concrete example which unveils the process we use at N/V Logistics to achieve optimal classification.